Windows 10 will let you schedule the exact time and day that works best for you to have your computer restart to finish installing the Windows updates. 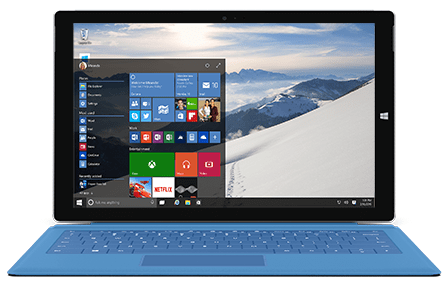 Microsoft has made Windows Updates happen automatically through several years of different versions of Windows. This is to make sure you have the latest security, stability, and feature updates without having to think about it. However, you do think about it when you computer suddenly restarts when you’re right in the middle of getting things done. Or maybe while you’re in the middle of an important TPS report, walk away from the computer to grab a snack, and come back and see your data was lost because it restarted. This was especially a problem with Windows XP SP2, but in Windows 7 the issue was alleviated a bit by popping up a reminder letting you know there needs to be a restart, which you can set to remind you to do a restart up to four hours later. But it will keep nagging you until the restart is done. And Windows 8 gives you two days before the restart is required, and will usually do it automatically when your computer has been idle for some time. Windows 10 will allow you to schedule the exact time and day that works best for you to restart to finish installing the updates. To set this up, go to Settings > Update & Recovery. Then under Windows Update, select Check for Update, and if there is an update available, it will be downloaded and installed. 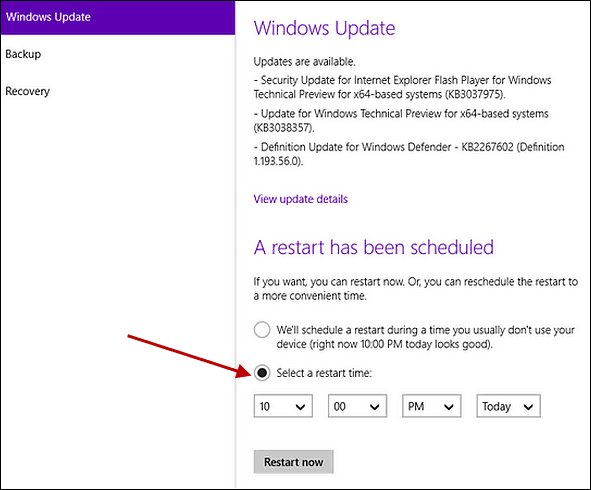 If one of the updates requires a restart to complete, you’ll see “A restart has been scheduled” section where you can select the restart time. Just select the time and day that works best for you to have it restart. Automatic Windows Update restarts has always been an annoyance in Windows one way or another, but with the latest version of the OS, you will be in control. This is just one of the minor improvements coming to the new desktop OS…it’s the little things that make a big difference. Not until you upgrade to windows 8 then you can update to windows 8.1 free then join the preview windows ten and update to win10 free which is a sub beta program. I had windows 7 pro and that’s what I had to do. Unless it’s changed that the only way I know of to get to win 10 preview. You can upgrade to Windows 10 directly from Windows 7. Anyone who says you have to go to Windows 8 first must have been living under a rock for the last several months since there have been hundreds of articles and blog posts about that. There are some caveats about upgrades though. You can go from Windows 7 professional to Windows 10 professional or higher SKU, however you cannot go to a lower SKU. For example, you cannot go from Windows 7 Professional to Windows 10 Home Edition. You also cannot go from a 32 bit OS to a 64 bit, or vice versa. Also you might have to uninstall your existing anti-virus software to do the upgrade, and then reinstall it afterwards as long as it is compatible with Windows 10. Check with your anti virus software maker to be sure the version you have is compatible. Oh, I didn’t mention that I had to buy windows 8. I have programs that run for a week or and cannot be interrupted. I let the programs run unattended. Windows 10 pops up a notification that it has scheduled an update for 22:00 and that I should change the schedule. Well I do not see the notice because I am away. The computer restarts and destroys all the work that took several days to run. I do not want Windows or any other program to automatically restart my computer at any time: I decide when to restart! I have send reports several times on this subject in the Preview program but nobody is listening. This propaganda is B.S. I was updating a windows 10 computer while using a different windows 10 computer, and I told the one I was updating to restart (I was going to diner), and when I came back they BOTH had restarted. The other one I was using (and not updating) was on local not Microsoft account (except maybe for cloud). Hi, thank you for the answers. My problem is I live in an area where there is max of 4G which is not cheap through my cell phone (data pkg. ), that is how I use my laptop. But my new Acer with Windows 10 is going through that data in about hour, doing updates I am thinking. How do I stop and schedule the actual download of a new update. Need to be able to schedule when I am in town and can use the WIFI at work. Brandi, there is a trick to your issue. When you are on your mobile connection, open the settings app, go to Network & Internet, Wi-Fi, Advanced Options (below all the networks), and finally turn on “Set as metered connection”. That will disable updates and other bandwidth-intensive operations whenever you connect using your mobile. Windows will remember this setting for the next time you use your mobile. The select a restart time button is grayed out. This renders your post false. And it needs to be updated. This true for my windows 10. It says it wants to update to the latest version of windows 10 with a restart, which it scheduled at some bizarre time like height of useage, which is greyed out and cannot be changed. Alternatively I could initiate this with a restart button, which btw has no effect other than a restart. I eventually found the scheduled task in Task Scheduler, I was able to change the time in properties of one of the event triggers, which should have initiated the install within a couple of minutes. Only to discover an error message saying Task Scheduler had lost contact with Task Manager and I could not save the settings, or close the Task Scheduler. Having gone past the fixed time for this update some 3 hours later, I got a notification to restart, and when complete (took 20 seconds) nothing had changed and the update was still showing with a restart and another time scheduled. I have run the Update Troubleshooter as admin, but it didn’t find anything wrong. Searching the web, I can find similarities with win7 and server 2003, but even on MS forums the results for this error in Win10, only show the same results! What I want as I am not a mindless user, is control over events any programme carries out, that mean it incapacitates the working of MY computer. If MS do not fix this, I will swap to the other 2 OS’s I have been using of late, Linux and Googles OS which behave in a proper manner to the owner of the hardware.